I promised to locate the images of myself in the cowboy garb the orchestra and I were required to wear to match the theme of the show. Thankfully a few photos have surfaced. This first one shows my two daughters and I standing outside Trigger’s horse trailer. In this matching image of me with my two sons, I have put the cowboy hat on my head and you can now see the buckskin fringes. Thanks to the magic of Kodachrome, the colours are still vivid after all these years. 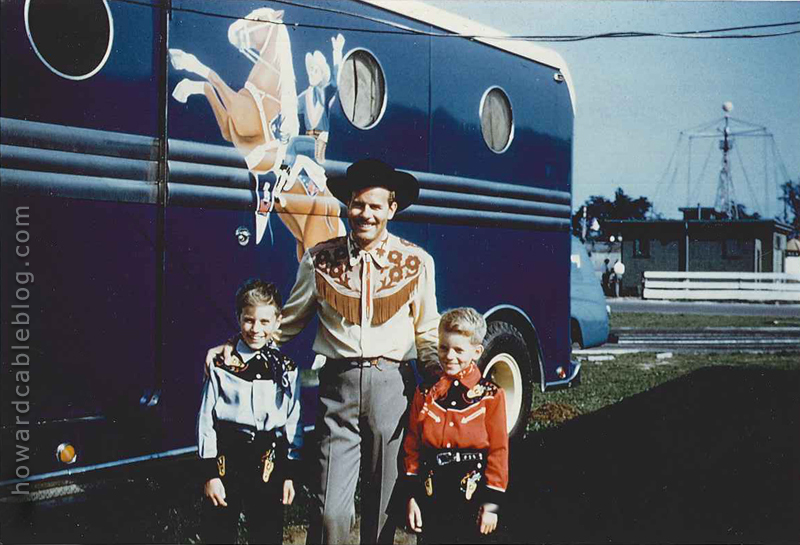 With my two sons beside Trigger’s horse trailer at the CNE 1954. 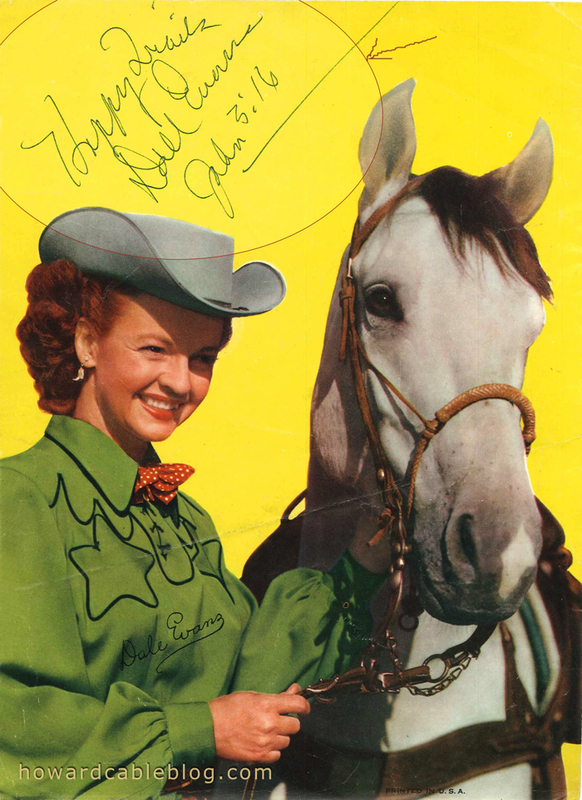 I also wrote in that post about how Dale Evans signed all of her autographs with a reference to a bible verse. My daughters were kind enough to share with me the 8×10 photo she signed for them. You can clearly see “Happy Trails, Dale Evans, John 3:16” at the top. If you missed the original post, you can find it here. If you are enjoying my blog posts and want more, please become a follower. 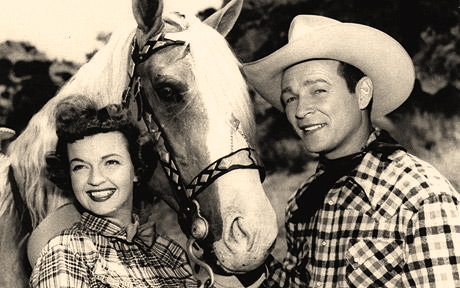 The next post will talk about Gene Autry, the not-so-wholesome cowboy. 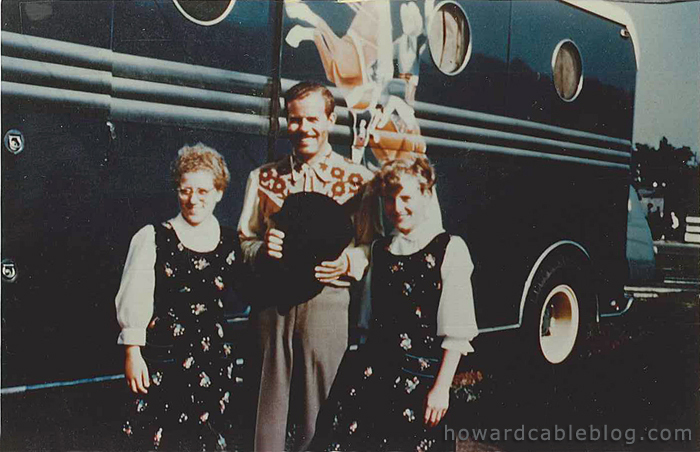 The favourite of the time was Roy Rogers, and fans were delighted when he came to the CNE Grandstand Show in 1954. I didn’t know much about him beforehand, but I grew to like him because he was so open and friendly. He was great with the audience – especially children. The “Roy Rogers’ Circus” as it was billed, was wholesome family entertainment. The thing I found interesting about this show is that every living and non-living component, had a name and personality. Roy rode a horse named Trigger; Dale rode Buttermilk. Roy’s comic sidekick, Pat Brady, drove a jeep called “Nellybelle.” It was as if these were all members of the family. Trigger, a beautiful golden Palomino, had a career of his own. He was known as “The Smartest Horse in the Movies” because of all the tricks he could do. I can remember two of them: One was walking on his hindquarters, and the other was his ability to count. Roy would ask, “Trigger, what’s two plus two?” and the clever horse would scratch the ground four times. It was obvious how much Trigger was loved by how well he was treated and how they dressed him. He was outfitted with a gorgeous saddle, which I later found out was worth as much as that year’s Cadillac. Roy’s theme song “Happy Trails” was actually written by Dale. She was not just a pretty face and may even have been the brains behind the act. She was also very religious. Each time she signed an autograph, she included the reference to a bible verse from Mathew. I can’t remember off the top of my head which verse it was, but I’m sure my daughters have it in their autograph books. P.S. If you are wondering what I look like in cowboy gear, as soon as I find the photo, I’ll post it.